People pack the streets of Las Vegas, searching for just about every kind of entertainment imaginable. Bright lights flood The Strip with glitz and glam, casino doors open and closing, emitting the sounds change pouring in and out of slot machines. All of this easy access to entertainment is exciting, but the constant bombardment of noise, crowds, and lights can become overwhelming. So, what is the best way to escape the city? Rent a car and take a road trip from Las Vegas to Brian Head, Utah! The open roads, vast landscapes, and stunning stops are the perfect cure for those looking to savor a reprieve from the hustle and bustle of city life. Once you arrive in Brian Head, there are countless outdoor activities and adventure that await you. 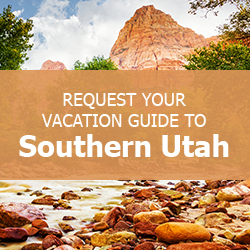 Request our free Southern Utah Vacation Guide to discover local tips and info on where to find the top things to do in the area! Bringing the whole family on a trip from Las Vegas to Brian Head, Utah, is easy when you don’t need to deal with the hassle of catching a flight. Only about 200 miles northeast of Vegas, Brian Head is about a three-hour drive with beautiful scenery along the way. Trade in the long lines at TSA and waiting at the airport terminals for time on the road gazing at stunning landscapes. Throughout the Zion National Park region, you’ll see amazing geological formations, canyons, and more. When you’re getting ready for your voyage, take note that even though the trip is short, the change in elevation means that the weather is vastly different. Prepare by renting a vehicle with four-wheel drive capability. If you’re making the trek from Las Vegas to Brian Head, Utah, in the winter, you’ll probably want to hit the slopes when you arrive. With amazing dry snow and a reputation for great skiing, you could easily spend your entire vacation enjoying this classic cold-weather pastime. However, there are many other great winter hobbies to try as well. Snow tubing, snowmobiling, and snowshoeing across the backcountry are all exciting ways to get outdoors and experience this Winter Wonderland. Summertime also features a fantastic array of outdoor activities for the entire family! Embark on a Zion ATV tour, or try one of the many hikes through Bryce Canyon, including Sunset Point. Choose Your Brian Head Rental Property! The perfect retreat awaits you in the beautiful backcountry of Brian Head, Utah! We offer an extensive list of condos and vacation homes that hold anywhere from five guests to 24 guests! Each of our rental properties is steps away from the Brian Head Resort slopes, and most of our cabins have extra parking where you can store your ATV or snowmobile rentals! You’re also just down the road from scenic Cedar Breaks National Monument and Dixie National Forest. If you loved Zion National Park, take an hour drive west to explore Bryce Canyon National Park. Whatever you choose to do during your time getaway to Brian Head, you’ll create lifelong memories in our breathtaking of the Beehive State. Ready to plan your road trip from Las Vegas to Brian Head, UT? Book one of our condos or cabins today for an unparalleled experience! We look forward to welcoming you to Southern Utah!